▶ Easier operate in critical regions such as chaotic section of city, bridge area and the vicinity of high-voltage wires than crane hammer does. ▶ Equipped with high-powered hydraulic piston motor and suitable bearing for high frequency vibration. 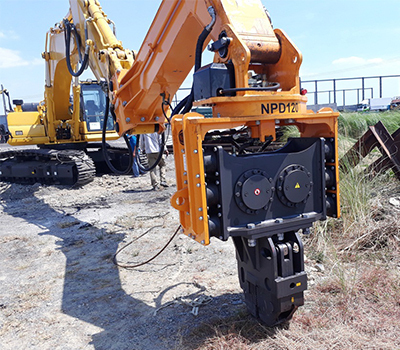 ▶ Easy connect and disconnect the hammer by the use of excavator’s breaker hydraulic lines. ▶ Comfortable pile driving and pullout of seat pile, H-beam and tube pile with wire hanging method. 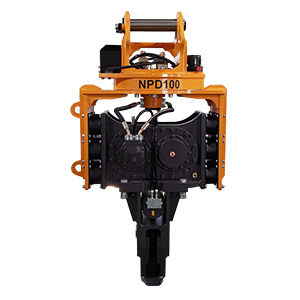 ▶ The clamping lug can handle and move construction objects easily. ▶ Sufficient wear-resistant design and 360-degree revolution. ▶ Install vibro isolating rubber for high frequency purpose. ▶ Lower cost of maintenance than crane hammer. ▶ Outstanding workability and mobility.